Nicholas Mangan, Ancient Lights (2015). 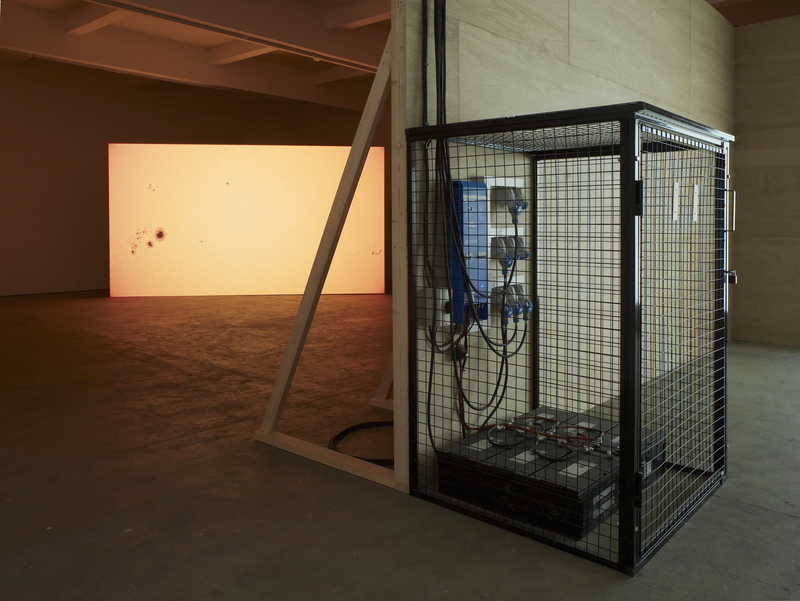 Installation view, Chisenhale Gallery, 2015. Co-commissioned by Chisenhale Gallery, London and Artspace, Sydney. Courtesy the artist; Labor Mexico; Sutton Gallery, Melbourne; and Hopkinson Mossman, Auckland. Photo: Andy Keate. Nicholas Mangan’s Ancient Lights is the first solo show in the UK for the Melbourne-based artist. It is essentially a film installation, but more than that it is a sculpture of light; light which has been generated by the harnessing of energy provided by our sun. In this work Mangan considers the relationship between energy and social transformation through his research into the physical and conceptual power of the sun. To be inside the gallery is to be immersed in a vast dynamic cell dependant on the hours of British sunshine. Apt then is the title which nods to the colloquialism used to refer to a quirky English common law which protects the right to light under The Prescription Act of 1832. The questions arise: Do we have a right to light? Is it a given? If yes, then how has this energy been used as a commodity? What role has this power played in our human culture, economy and technology? Through the white double doors of Chisenhale Gallery and into the darkness of a narrow hallway. A small bulb, suspended by a thick cable, hangs at knee-height highlighting the floor with a pool of dim light. There is a loud droning industrial hum and an eerie glow on the wall ahead, indicating the way into the main gallery which has been divided into two large chambers. These chambers are empty except for a projector and large screen in each; on the dividing wall there is a cage containing big bulky batteries with thick black cables stretching out, pinned with neat precision connecting each of the physical elements of the artwork. The design brings to mind Peter Halley’s painting Two Cells with Conduit & Underground Chamber, 1983. These black cables disappear into the ceiling where they find their way to solar panels that Mangan has attached to the roof of the building; of course, the viewer cannot see the solar panels yet knows they are there, for without them there would be no energy, no light, no exhibition. Two different films are shown in the separated rooms but which are connected by the power source of solar energy that fuels the whole in an “off-grid” closed circuit. Acting as a sculptural vignette the first film is a loop of a perpetually oscillating Mexican ten-peso coin, on its obverse is a depiction of the Aztec Sun Stone excavated in 1790 at the Zócalo, Mexico City. The motion is hypnotic and mesmerising as the gold and silver coin appears to dance on a pure white background, its molten reflections flashing like solar flare. We are encouraged to connect the sun with the ancient, the ancient with superstition, superstition with sacrifice and sacrifice with currency. The droning of the soundtrack adds an unsettling magnetic quality to the metal titan on screen and a sense of the manipulation of physics. It soon becomes apparent that the acoustic is part of a soundscape belonging to the second chamber, which at points jolts the nerves with crackling electric sizzle; an effect that fortifies the visuals of the second film. The second film is a montage of imagery including footage of the Gemasolar Thermosolar Plant in Southern Spain and the Laboratory of Tree-Ring Research at the University of Arizona. Beautiful and peaceful images of vast swaying solar panels reflecting azure skies become strange metallic circles with a core which morph into a slow turning cross section of a tree, showing its ageing rings with glistening resinous knots and the pencil marks of scientific study. A fruit laden orange tree frozen from an ice storm demonstrates the extremes of unstable weather systems juxtaposed with screeching audiovisual data from NASA’s Solar Heliospheric Observatory project. Scenes of thick smog suffocating an otherwise colourful dawn over the dense architecture of a metropolis, loud noisy and savage, evokes a sense of responsibility for the pollution caused by our cultures in the name of industry. But it is the raging hotspots of the burgeoning fired surface of the sun, fullscreen and overpowering, that can fool us into feeling the incredible force created by this awesome spectacle. The merit of Mangan’s work lies not just within his mature treatment of his globally significant subject but in the employment of current technologies, clean energy, light and sound, to create his sculpture – ultimately blurring conventional categories. This installation activates a conceptual mood board in the imagination whereby art meets science, social science, environmental awareness, politics and economy. The viewer is seduced into a real active engagement with the work: it is unequivocally contemporary and vitally relevant. This investigation generates so many ideas, all bouncing off at tangents and yet converging into a thought-provoking coherent whole where the beauty emanates from the simplicity of its execution. Ancient Lights is a truly illuminating example of less being most definitely more, where vitality comes not from the ancient power source that drives it but from the creative and imaginative energy that is generated by the concept, research and thorough application of its author. Ancient Lights is produced in partnership with Artspace, Sydney, where it will be presented as part of Nicholas Mangan’s solo exhibition, Other Currents, in September 2015.